Husband and I got in our best ever day of body boarding earlier this month at St. Peter's Harbour Lighthouse Beach in the North Shore of Prince Edward Island. The waves were in the 5ft range and we imagined we looked like these two above ::::wishing:::::. The sesh was so good that the Mr. broke his board. So I popped "body boards" and "boogie boards" into the Google machine to see what's out there. 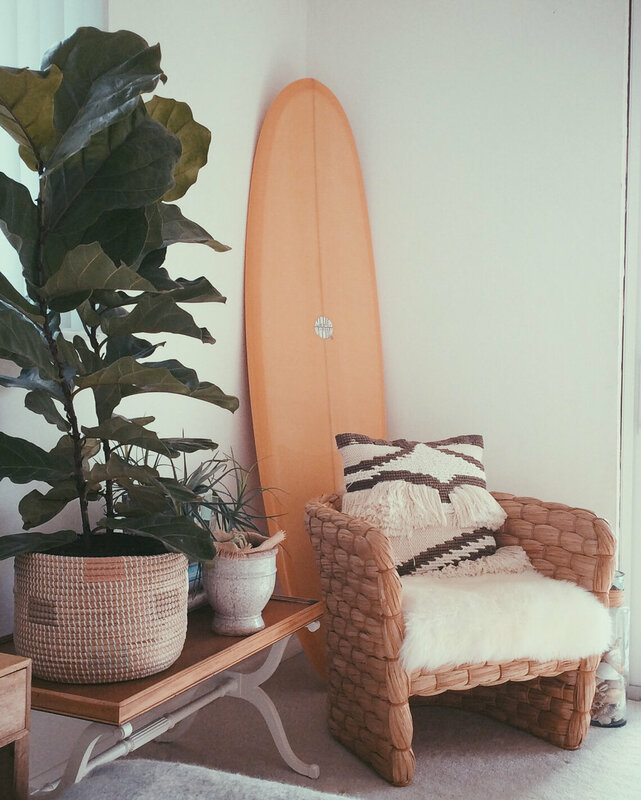 But then I hit Pinterest and the search took a very sharp turn — away from boogie boards, into surf boards and then to interiors. So today I offer this appreciation of the surfboard as decorating. So. Chic. The best kitchen focal point I've seen in a while via Coastal Style Blog. Boards and door amazingness, SJB Architects, Australia. Photo: Sharrin Rees. The one and only Cruz board (for a cool $14.5K) from Kelly Wearstler. 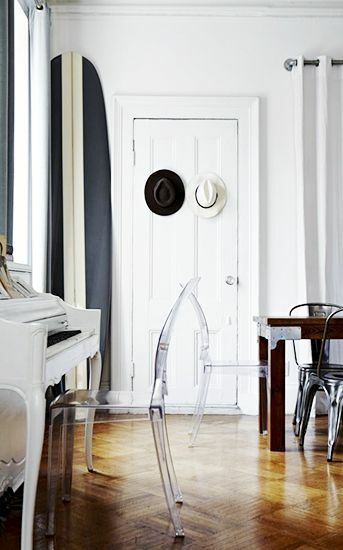 This monochromatic surfboard was designed to match this Gramercy Park apartment of world traveler Kristin Barone. Photo: Michael Mundy/An Afternoon With. This breezy Floridian home features a vintage 1950s balsa rood board. Design: Julia Star Stanford Design. Photo: Wally Sears. Mikey DeTemple's oceanside hideaway in Montauk, NY packed with old beach treasures including several vintage boards. Photos: Zak Bush. A Queensland home with a strict black and white palette and a great looking little board tucked in a corner. Design: Simone Barter Design Studio. The Haydenshapes marble line of boards is pretty much the coolest. Here's one just making this room. Absolutely making it. An Oxnard home by Giannetti Home with paintings by Steve Giannetti and a spectacular vintage board. 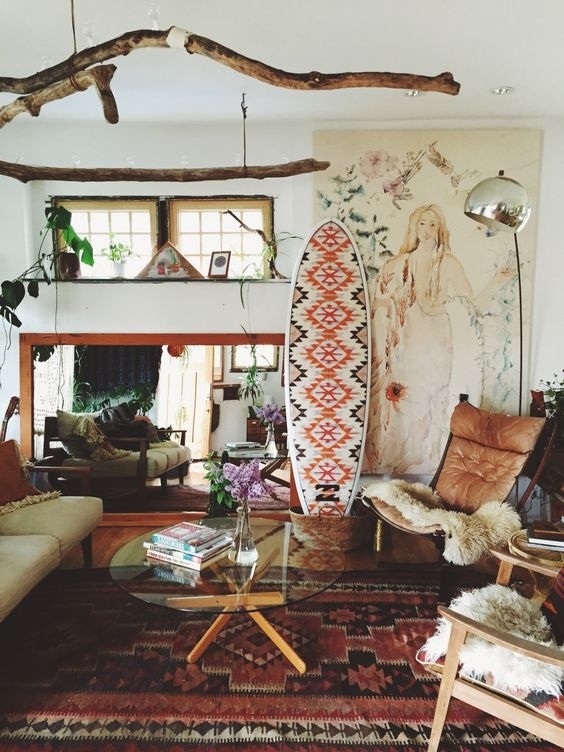 A California hacienda by Erin Martin with custom surfboard by Kelly Wearstler. Love the ropes — and of course the mix of graphics with the mud cloth and board! Photo: Douglas Brenner. A view of the Roman & Williams studio via Instagram. Whodathunk surfboard as office decor? Them apparently. An old railway cottage in Santpoort, The Netherlands by Zecc Architecture is flooded with light and maintains its industrial edge. A sunbleached board basks in some rays.